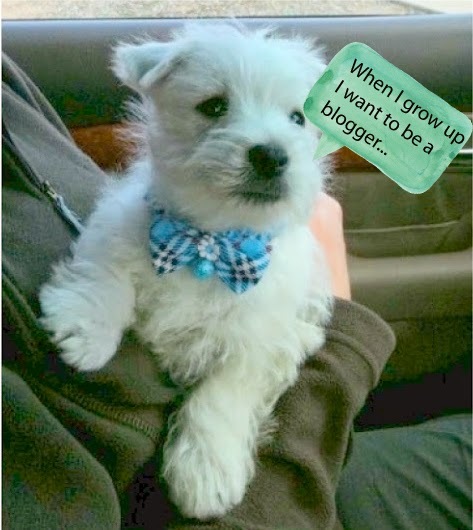 The White Dog Blog: Happy Barkday to MOI!!!! Well, it's a big week for birthdays around here. Today, we celebrate MOI. Wooo hooooo, puppers!!!! The picture above was taken when I was 8 weeks old and on my way to mom and dad's house. It looks like I knew from the very beginning that I was going to write a blog! I am 5 years old today, puppers. FIVE YEARS OLD!!!!!! As my dad said when we woke up this morning, it's been QUITE a ride!!! Have an extra treat on me today, puppers! Happy birthday Duncan and we hope your special day is one filled with fun and treats. Have a terrific Tuesday. Have a very HAPPY BURFDAY Duncan. Happy Birthday, Duncan! Hope you have a wonderful day with lots of toys, treats, and cuddles. Happy Barkday!!!! I'm 5 too and i telly that's a grrrrreat age! Send you a giant hug and I hope you will get a super cake today! omd OMD we love your BOW TIE.... Ernie is GREEN with Jellyness over it... He loves a BOW TIE.. Happy 5th Birthday, Duncan! We hope you're having a fabulous day with lots of treats and hugs! Happy Birthday Duncan. Hope you have a splendid day! Wow, five years old eh? An extra treat??!! We'll be in that. You have a wonderful celebration. Happy Birthday! We hope you have a fantabulous Barkday Duncan!!! Yep....and we been witness to it all....anywho, HAPPY BIRTHDAY, a big old 5! Happy Birthday Duncan! We will take you up on that offer for another treat too. Wells, I sure hopes you got lots of balls, pupcakes, and giftbags!!! Oh, and margaritas!!!! You can't forgets the margaritas! Hope you had a grrrreat birthday and got lots and lots of treats! I just love puppies. being a human we should love animals. so cute pupps. thank you for sharing such a cute post.keep posting.